80s nostalgia seems to be everywhere these days, with 20th Century Fox's X-Men: Apocalypse set in 1983 and a reboot of the 1984 classic Ghostbusters set to hit theaters on July 15. Ironically, the same day that Ghostbusters hits theaters is when Netflix will debut its new TV series set in the 1980s, Stranger Things. To get fans ready for this series, Netflix has unveiled the first trailer, which will transport you back in time to this glorious decade. Set in Hawkins Indiana in the 1980s, Stranger Things chronicles the search for a young boy who vanishes into thin air under highly suspicious circumstances. 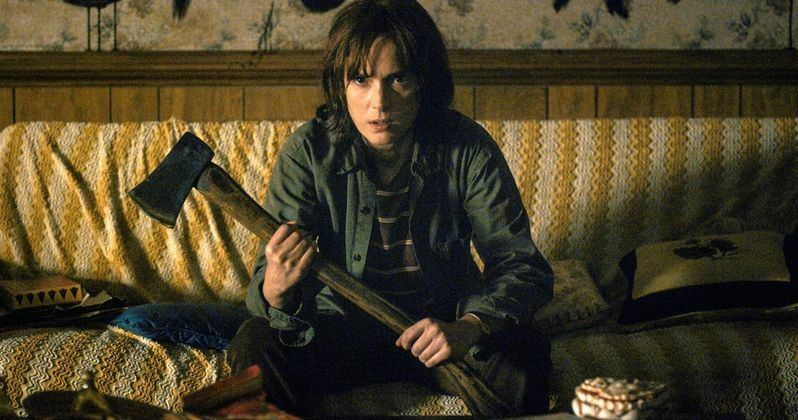 His mother (Winona Ryder) opens an investigation into the boy's disappearance with local authorities that unravels a series of mysteries involving top-secret government experiments, terrifying supernatural forces and one very strange little girl. A love letter to the ubiquitous cult classics of the 80's, Stranger Things is a coming of age story for three boys that draws this quaint community into a world where mysteries lurk beneath the surface. Stranger Things stars Winona Ryder (Joyce Byers), Matthew Modine (Dr. Brenner), David Harbour (Chief Hopper), Charlie Heaton (Jonathan Byers), Natalia Dyer (Nancy Wheeler), Millie Brown (Eleven), Finn Wolfhard (Mike Wheeler), Caleb McLaughlin (Lucas Sinclair), Gaten Matarazzo (Dustin Henderson) and Cara Buono (Karen Wheeler). The supporting cast also includes Noah Schnapp (Bridge of Spies). The new drama series written and directed by Matt Duffer and Ross Duffer (Wayward Pines, Hidden) consists of eight, one-hour long episodes. The Duffer Brothers are writing, directing and showrunning the series, and will serve as executive producers along with Shawn Levy and Dan Cohen via their 21 Laps entertainment banner (The Spectacular Now, Night At The Museum, Real Steel, Date Night). Stranger Things is a Netflix production. We'll have to wait and see if Stranger Things will be the next hit series to debut on the popular streaming service. In addition to the trailer, we also have the first poster, which has a heavy 1980s influence as well, along with the first five photos from Stranger Things. With just under one month left until Stranger Things debuts, we'll be sure to keep you posted with more footage and photos from this sci-fi series. Until then, take a look at the trailer, poster and photos, to revisit the 1980s with Stranger Things.